One of the many reasons deep breathing helps you to relax is that it allows you to move from a Beta state to Alpha state. When I refer to Beta and Alpha states, I’m talking about the oscillations of your brain waves. When you’re in a Beta state, the oscillations are approximately 14-14 cycles per second. In an Alpha state, the oscillations of your brain waves are slower at about 7-13. There are specific emotional states associated with brain wave activity. In a Beta state, you might feel nervous, anxious, uptight, edgy, and frustrated. In an Alpha state, you feel free, easy, relaxed and connected. So simply by breathing correctly, you can move yourself from a Beta state to an Alpha state. How awesome is that? You don’t need to be a victim. 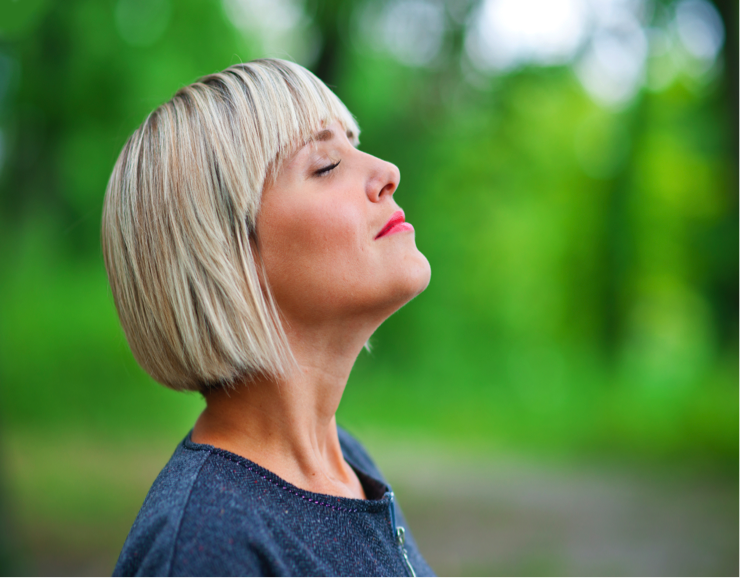 Learn the skill of diaphragmatic breathing, and you’re in charge! To learn how to breathe diaphragmatically, place one hand on your stomach and one on your shoulder. Now inhale while keeping your shoulders down and allowing your stomach to expand. As you exhale, contract your stomach muscles as if you’re bringing your belly button closer to your spine. The important thing to remember is to keep your shoulders down so you really take in a deep breath rather than breathing shallowly in your upper chest. I am a dental hygienist who worked in a very non ergonomically correct office for yeas. It created a problem with my hip and a slight scoliosis to the right in my spine. I started doing yoga to help correct the problem and get my body balanced. I can’t have a spine issue affect my riding! By doing yoga I have become much more aware of my breathing! I would recommend it to anyone. Even if you are not a “yoga person” and don’t want to do it forever, a few classes to help you control breathing might be great. Good luck and great riding!